Sacmi Packaging will be heading to Berlin with the all-new TF 40 Imola. Also taking centre-stage will be the “compact” TF 80 and the modular TF 70, flagship units of a range that has won widespread market acclaim thanks to great productivity, reliability and flexibility. Sacmi’s top tray-forming technology will play a starring role at Fruit Logistica, the international fair dedicated to fruit and vegetable processing technology being held in Berlin from 5th to 7th February. Taking pride of place on the 102 m2 Sacmi stand (hall 4.1, stand A-13) will be the brand new TF 40 Imola, a perfect synthesis of all the best tray-making machine know-how developed in Imola. 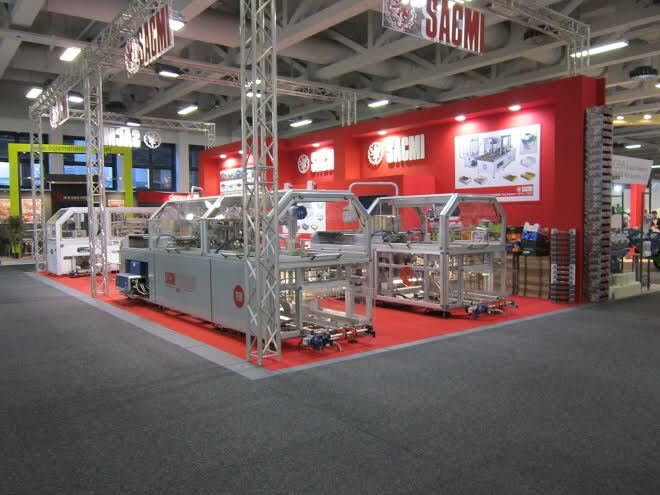 The TF 40 Imola encapsulates Sacmi Packaging’s more than 20 years’ experience (which led to the TF 40) and the very best technology from Imola-based SMI Packaging, the tray-forming machine branch of which was taken over by Sacmi at the end of 2012. The result? A machine that combines maximum performance with outstanding reliability. With the modular TF 70, instead, the focus shifts from the all-new to the more tried-and-tested. Already presented in 2013 as a prototype, Sacmi can now provide this machine complete with a TS 60 stacker. The distinctive characteristic of the machine is, naturally, its modularity, which allows – starting from different base modules (magazine, press and corner unit) – the user to obtain a forming machine for standard trays (the TF 50) or the new TF 70, currently the most competitive, highest-performing solution on the market for the manufacture of trays with corner posts. The strong points of the modular TF 70 also include – in addition to the high output rates of up to 50 pieces/min provided by the dual feed chain and other technical solutions – the possibility of working in line with the new stacker, redesigned by Sacmi to cope with the high output rates of the new machine and so manage two trays in parallel, up to a maximum length of 800 mm, and make stacks without any height limit. Other new Sacmi-developed advantages for the fruit and vegetable sector include reduced maintenance requirements, user-friendliness and fast size changeovers: advantages that really make the difference compared to competitors’ machines. Flexibility, productivity and – in this case – extreme compactness are also the key traits of the latest Sacmi solution, the TF 80, also to be showcased at the Berlin fair: this automatic tray forming machine can manage two different tray sizes in parallel with output rates of around 120 pieces per minute. The perfect attention-grabber, then, for a fair such as Fruit Logistica, expected to attract over 58,000 visitors from over 130 countries.